In pursuance of the provisions of the Local Government Act, 1993 and the Regulations thereunder, notice is hereby given that a POLICY REVIEW COMMITTEE MEETING of Penrith City Council is to be held in the Passadena Room, Civic Centre, 601 High Street, Penrith on Monday 16 October 2006 at 7:00PM. Councillor Jackie Greenow - 4 October 2006 to 22 October 2006 inclusive. Policy Review Committee Meeting - 11 September 2006. His Worship the Mayor Councillor John Thain, Councillors Jim Aitken OAM, Kaylene Allison, David Bradbury (arrived 7:33pm), Lexie Cettolin (arrived 7:07pm), Kevin Crameri OAM, Mark Davies, Jackie Greenow, Karen McKeown, and Pat Sheehy AM. PRC 73 RESOLVED on the MOTION of Councillor Jackie Greenow seconded Councillor Pat Sheehy that apologies be received and accepted from Councillors David Bradbury, Lexie Cettolin, Greg Davies, Susan Page and Steve Simat. Leave of Absence was previously granted to Councillor Ross Fowler for the period 3 September 2006 to 25 September 2006 inclusive. Leave of Absence was previously granted to Councillor Garry Rumble for the period 6 September 2006 to 28 September 2006 inclusive. PRC 74 RESOLVED on the MOTION of Councillor Jim Aitken seconded Councillor Karen McKeown that the minutes of the Policy Review Committee Meeting of 14 August 2006 be confirmed. Councillor Lexie Cettolin arrived, the time being 7:07pm. Councillor David Bradbury arrived, the time being 7:33pm. Councillor Mark Davies returned to the meeting, the time being 7:56pm. Councillor Lexie Cettolin left the meeting, the time being 8:05pm. Councillor Lexie Cettolin returned to the meeting, the time being 8:06pm. Councillor Jim Aitken left the meeting, the time being 8:09pm. Councillor Jim Aitken returned to the meeting, the time being 8:14pm. Councillor Lexie Cettolin left the meeting, the time being 8:15pm. Councillor Lexie Cettolin returned to the meeting, the time being 8:20pm. Councillor Karen McKeown left the meeting, the time being 8:31pm. Councillor Karen McKeown returned to the meeting, the time being 8:33pm. Councillor David Bradbury left the meeting, the time being 8:35pm. Councillor David Bradbury returned to the meeting, the time being 8:37pm. His Worship the Mayor, Councillor John Thain left the meeting, the time being 8:42pm, and Deputy Mayor, Councillor Jackie Greenow assumed the Chair. His Worship the Mayor, Councillor John Thain returned to the meeting, the time being 8:47pm and resumed the Chair. Councillor Jim Aitken left the meeting, the time being 9:20pm. Councillor Jim Aitken returned to the meeting, the time being 9:23pm. 2. The proposed change to Director Accountabilities as detailed in the report be endorsed. 3. The proposed amendments to Term Achievements and Critical Actions as detailed in the report be adopted from 1 July 2006. 4. Congratulations be passed on to the staff who worked on the Strategic Program Progress Report document. His Worship the Mayor, Councillor John Thain left the meeting, the time being 9:40pm, and did not return. Deputy Mayor Jackie Greenow assumed the chair, the time being 9:40pm. There being no further business the Chairperson declared the meeting closed the time being 9:45pm. To inform Council of the outcomes of the Precinct-wide studies resulting in the refinement of the Concept Plan for the WELL Precinct, and to outline the next steps in the planning processes to advance the rezoning of the Caddens Release Area/Precinct Centre and the South Werrington Urban Village sub-precincts. The report recommends the adoption of the Refined Concept Plan for the WELL Precinct and the steps outlined in the report regarding the rezoning processes for the two sub-precincts. 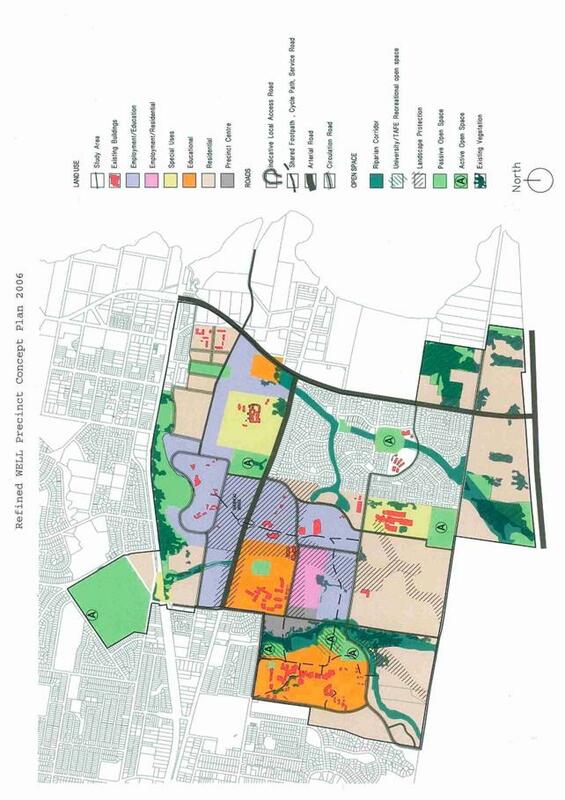 In the Councillor Briefing Session held on 15 March 2006, Council received a briefing on the background and the status of planning investigations underway for the Werrington Enterprise Living and Learning (WELL) Precinct. At that meeting, Dr Kevin Sproats of the University of Western Sydney (UWS) and Kerry Robinson of Landcom made presentations to Council on the current planning and development programs for the University lands and Landcom lands respectively. The Precinct-wide studies are now complete, which has resulted in the refinement of the adopted Concept Plan for the WELL Precinct. The Concept Plan is discussed later in the report. The Werrington Enterprise Living and Learning (WELL) Precinct is an area of approximately 670 hectares, bounded by the Western Railway and the Victoria Street/ Shaw Park precinct to the north, French Street/ O’Connell Street, the UWS Kingswood Campus and Kingswood residential area to the west, Caddens Road and the M4 motorway to the south, and the Claremont Meadows residential area and Werrington Road to the east. The WELL Precinct locality map is appended to this report. The Precinct is of strategic importance within both Penrith City and the broader region, given its scale, proximity to established urban development and infrastructure, tertiary institutions and the prospect of new transport linkages. 7. Seek the Department of Infrastructure, Planning and Natural Resources’ formal confirmation that local environmental studies under the provisions of the Environmental Planning and Assessment Act are not required as the basis of the formal statutory plan making process to be advanced within the WELL Precinct. · Seeking the creation of quality working, living and learning environments, delivering a viable, vital community, energised by the interactions and synergies of adjacent education, living and employment opportunities. · Incorporating principles of sustainability into the Precinct Strategy, and into the planning and design of the Precinct’s built elements. · Encouraging the development of innovative housing to support the needs of the facilities and the local community, adding to the viability of public transport systems, and contributing to the vibrancy and safety of the area. · Ensuring high quality transport access to these facilities and the surrounding areas, aimed at achieving a high modal split towards public transport in the area, constraining in car use through demand management and car parking controls. · Establishment of a village hub (known as the ‘Precinct Centre’) centrally located to optimise synergies between existing and proposed communities, education and enterprise activities. In November 2004, Council adopted the WELL Precinct Strategy. The Strategy outlines a clear framework within which the area’s potential can evolve into quality, sustainable urban outcomes for our City and the Region. It provides specific instruction and guidance for Council, landowners and Government agencies, as the basis for future landuse planning and development decisions within the Precinct, and establishes the principal arrangements that need to be embodied in those proposals. The Strategy initiative provides an important blueprint for the realisation of future opportunities and synergies between the various activities and as such, was recommended for Council endorsement. The Strategy incorporated a Concept Plan which indicates the preferred spatial arrangement of the major land use opportunities identified. The adopted Concept Plan is appended to this report. The Concept Plan is underpinned by a series of character statements which describe the precinct direction and outline the key design elements relevant for each area. These are included in the appendices to this report. The key stakeholders, UWS, Landcom and TAFE, have endorsed the WELL Precinct Strategy. Additionally, the Department of Planning (DoP) advised Council that it supports the WELL Precinct Strategy principles as the basis for land use decision-making in the WELL Precinct. 1. Precinct Centre (which includes the Employment Analysis Report). 2. Transport and Management Accessibility Plan or TMAP. 3. Hydrology and Catchment Management Study. 4. Greenways Network and Viewscapes. The key findings of the studies are set out below. A key agreed outcome for the WELL Precinct is the establishment of a village hub, centrally located along O’Connell Street, south of the Great Western Highway to optimise synergies with existing and proposed communities, education and enterprise activities. The recent studies confirmed a demand in the WELL Precinct and immediate environs for a neighbourhood scale retail / commercial centre of between 5,000m2 and 8,000m2 floorspace. The studies also found that, provided the centre was maintained at a neighbourhood centre size, the impact on the wider retail hierarchy, including the St Marys Town Centre, would be minimised. The preferred site that has emerged as a result of studies is an area on the corner of O’Connell Street and Second Avenue. The Centre would straddle O’Connell Street and provide the opportunity for a ‘main street’ format to be developed. The site has good walkable linkages to the proposed UWS rail station and is only some 300m from the proposed strategic bus corridor identified to be established on the Great Western Highway. The Centre, as proposed, would be classified as a ‘village’ under the Metropolitan Strategy’s retail centres hierarchy. 1. This location offers the best opportunity to provide a new ‘front door’ and focal point for UWS and TAFE, linking campus and student activities with the surrounding community – integration of the ‘Town and Gown’ concept. This will assist in creating a seamless integration of University, TAFE, business and community activity and vitality within the Precinct Centre. 2. The site is centrally located and affords the opportunity of including UWS and TAFE administration, recreation and other functions. It would be an ideal place for establishing student housing. 3. It will serve the demand arising from the new resident population and employees working in the Precinct. The site will be a convenient location for residents in the Caddens Release Areas, Claremont Meadows estate, and adjacent existing residential areas. 4. The site will be able to be serviced by a new bus route along O’Connell Street that would have the potential to also link through the new Caddens Road residential area, the University campuses and the proposed new railway station. 5. Its location close to the UWS, TAFE and the proposed Centre for Creative Industries, encourages longer periods of activity within the Precinct Centre. The Centre’s location will attract passing trade from students accessing each campus from the railway stations, driving to the campus carparks and student services /housing located within the centre at varying times of the day; and provides opportunity for the Centre to attain an active nightlife. Our key partners, Landcom and the University, support the Precinct Centre locating at O’Connell Street. The University, in its masterplanning of its Kingswood and South Werrington campuses, have assumed the Precinct Centre straddling along O’Connell Street and have identified pedestrian and urban design linkages to the Precinct centre from both campuses. In recent discussions with both the Ministry of Transport and RailCorp regarding transport initiatives for the WELL Precinct, these agencies have raised concern over the proposed Precinct Centre location, preferring the Centre to be located on the Werrington Army Signals site, closer to the proposed public transport offerings such as the University Railway Station and strategic bus corridor to be located along the Great Western Highway. It is understood that such preferences are based on the theory the Precinct Centre would assist demand for such transport facilities. The Maunsell and SGS Economics’ studies considered the Precinct Centre adjacent to the railway station and whether this will create an ‘activity node’, enhance rail patronage and as a result reduce vehicle kilometres travelled (VKTs) across the Precinct; and whether locating the Precinct Centre adjacent to the railway station will effectively deliver the principles set out in the adopted WELL Precinct Strategy. The outcomes of the WELL Precinct studies indicate that the proposed Precinct Centre itself would not generate any significant number of rail passengers or increase demand for rail services. It was noted that growth in rail patronage is more likely to be related to improvements in the major time related factors which influence rail travel, being frequency, journey time and reliability. Similarly, it is expected that there would not be significant patronage on the strategic bus corridor which would be destined for a Precinct Centre of the neighbourhood scale intended when the bus movements would be fundamentally between the Penrith and St Marys centres and beyond to Mt Druitt. We have raised these points to the Department of Planning and the transport agencies concerned and will be making further submissions to them in relation to the benefits of locating the proposed Precinct Centre in O’Connell Street as identified in the WELL Precinct Strategy. A Draft TMAP has been prepared and identifies opportunities for safe and convenient vehicle and pedestrian movement within and surrounding the WELL Precinct, with an emphasis on sustainable outcomes and maximisation of public transport patronage and pedestrian/cycle networks. The TMAP has modelled for residential and employment traffic that is likely to be generated within the WELL Precinct. As the TMAP identifies improvements to the arterial road network outside the WELL Precinct boundary, it attributes apportionment to such upgrades, based on the development of WELL, the TMAP needs to be approved by the RTA. In addition, the TMAP identifies bus service provision, as well as the University railway station, requiring Ministry of Transport approval. It is envisaged that the TMAP will be finalised shortly, and submitted to the RTA and MoT for their approval. The Werrington Arterial and the University railway station are identified as key infrastructure elements within the WELL Precinct that will assist in achieving a high modal split towards public transport in the area. These are regionally significant infrastructure items for which the State Government is the responsible authority. The development of the WELL Precinct Strategy has been premised on the provision of the UWS Station. The station has been incorporated into the draft TMAP for the Precinct and is an integral element in achieving the necessary mode shift to public transport for the Precinct as it develops. Council has been pursuing the State Government over the development of the station for many years and this matter was again raised with the Minister for Transport at the Cabinet Meeting held at Penrith in May. The Minister undertook to consider Council’s submission on this matter and seek advice from his Department staff. We have further corresponded with the Ministry of Transport since meeting with the Minister. A response is yet to be received from the Minister and his Department on this matter. A meeting was held recently with the Member for Mulgoa, Hon Diane Beamer, who undertook to seek a meeting with the Premier together with representatives from UWS and TAFE in order to reaffirm the Government’s commitment to the station and to determine a process and timeframe for its delivery. We are awaiting further advice on this opportunity. The UWS, TAFE and Landcom have indicated strong support for the delivery of the proposed railway station. It has been acknowledged that as a result of the rezoning process of sub-precincts within the WELL area, the opportunity will emerge for developer contributions to be made towards the establishment of the railway station as an element in satisfying the Government’s identified need for a Regional Infrastructure Levy to be applied to future development in the WELL Precinct. A firm commitment from Government for the station delivery is therefore a necessary prerequisite for the station to be included in the final TMAP for the Precinct. When this occurs, the TMAP can then allocate a cost share for the station to the Precinct, which would facilitate the station delivery. Correspondence has been sent to the Premier’s Department and to the Ministry of Transport pressing for such a commitment from Government. Replies are yet to be received on this matter. The outstanding responses from Government will continue to be pursued. The Employment Prospects Analysis report has revealed the potential for the WELL Precinct to create up to 7,826 jobs, including up to 6,000 jobs in the Werrington Enterprise Technology Park (currently the UWS land north of the Great Western Highway) and around 350 jobs in the Precinct Centre. It is also anticipated that approximately one third of these jobs would be generated indirectly as a result of support activities locating on the site. However, in the case of the Enterprise Technology Park and the Creative Industries Precinct it is apparent that the demand from the target industries is unlikely to be realised in the short term. However, these areas in combination provide a significant ‘business park’ style employment opportunity for the City which is currently low and as such it is likely that the employment aspirations for these sites will not be realised in the short to medium term. It is apparent that the potential employment yield of the WELL Precinct will have a significant impact on achieving the jobs challenge. The potential employment yield far exceeds this figure. However, it must also be recognised that a significant proportion of this employment yield calculation (86.2%) represents a supply-led approach to estimating employment and this may not be realised. Nevertheless, the sub-precincts for which there is established demand (that is South Werrington and the Precinct Centre) suggest that up to 1,083 jobs will be generated, thus achieving 29% of the jobs challenge on-site. Additional jobs will be provided through home-based businesses, and through indirect job creation off-site. The Greenways Network and Viewscapes Study identifies remnant vegetation, significant viewscapes both to and from the study area, and makes recommendations about active and passive open space quantums and locations, viewscape protection and riparian corridors. The main outcome of this study is an open space structure plan upon which the open space system for the WELL Precinct will be based. 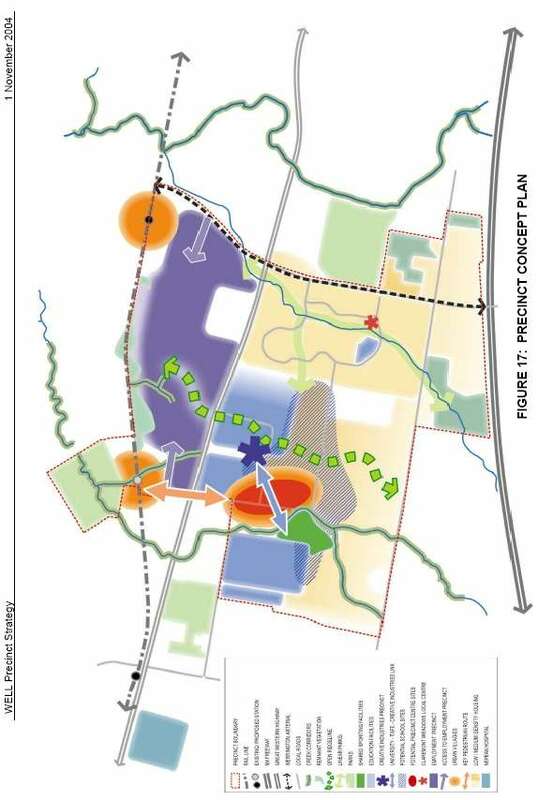 To satisfy Council’s active open space requirements for the projected population for the WELL Precinct, this study has identified 3 additional active open space areas totalling around 14 hectares, located on the Great Western Highway (adjacent Cobham), on the northern side of Caddens Road (adjacent Claremont Meadows) and in the UWS Kingswood campus (off O’Connell Street).. This proposed active open space provision is in addition to around 21 hectares of existing active open space within the WELL Precinct (which includes Claremont Meadows). The proposed passive open spaces are located principally along the railway line, in the north of the WELL Precinct, in Claremont Meadows and in the South Werrington Urban Village. The passive open space provision exceeds Council’s requirements. An Open Space Structure Plan is also part of the study and recommends pedestrian and cycle mobility through the WELL Precinct, as well as connections to South Creek and St Marys. The study also makes recommendations for maximising views to and from the WELL Precinct through sensitive development of hilltop areas, principally in the Caddens Release Area and UWS lands. The Hydrology and Catchment Management Study provides details of the catchment and drainage regime within and beyond the WELL Precinct, particularly along Claremont Creek, Werrington Creek and its tributaries. It recommends that the identified riparian corridors be retained and enhanced, restoration of creek lines to their natural state, and that drainage and detention requirements meet the anticipated level and type of development being planned across the WELL Precinct. Flooding is not a major constraint to development in the WELL Precinct provided that these requirements are undertaken. The study recommends engineering strategies for water quality treatment, wetland treatment and water detention, in the proposed developments in the Werrington Creek and Claremont Creek catchments. Council has commissioned the preparation of an Infrastructure Delivery and Funding Plan (IDF Plan) for the WELL Precinct. The IDF Plan will identify all infrastructure (State, local and other infrastructure) that is required to meet the demands generated by development of the WELL Precinct, identify the capital and recurrent costs, mechanism, and the party/ authority responsible for delivery of specific infrastructure, including indicative staging of delivery. This is due to be completed shortly. In conjunction with the IDF Plan, a Section 94 Contributions Plan is also being prepared for the WELL Precinct, identifying the local infrastructure elements required for the delivery of the WELL Precinct development, including costing for the delivery of the infrastructure. The State Government has also introduced a policy for Regional Infrastructure to be funded by developers for new urban releases, to ensure that specific infrastructure crucial to the development is provided in a timely manner, for example, UWS Railway station, Werrington arterial, Primary School, improvements to the arterial road network. · Provide certainty for business and communities that infrastructure will be provided. Concurrently with the ‘special contributions area’ declaration, the Minister will also determine the level and nature of development contributions that may be imposed as a condition to a development consent under Section 94EE of the Act. Such a contribution is payable to the State Government, for the provision of the identified regional infrastructure required. Under this process, Council will still be able to levy for local infrastructure itemised in its Section 94 Developer Contributions Plan for the area. We are currently examining opportunities with DoP of having the WELL Precinct listed by the Minister as a special contributions area. A further report will be forwarded for Council’s consideration in regard to the draft Infrastructure Delivery and Funding Plan and draft Section 94 Contributions Plan when finalised in conjunction with the South Werrington and Caddens Release draft Local Environmental Plans. The recently completed Precinct-wide Studies provide detailed information on likely housing and population yields, areas available for employment and economic development, and clear definition of areas for riparian and conservation corridors as well as active open space areas, enabling further evolution of the adopted WELL Concept Plan. As a result, the Refined Concept Plan for the WELL Precinct has been prepared which more clearly delineates the land use activities within, and connectivity across, the Precinct. The Refined Concept Plan is consistent with the identification of the major land use precincts in the adopted WELL Strategy, and their general spatial distribution in the Precinct. The refined Concept Plan builds on the version adopted by Council with the WELL Precinct Strategy and in effect retains the same general disposition of land use arrangements originally contemplated and provides greater definition to the areas and edges of each of those principal land uses identified. The Concept Plan is not intended to be a zoning plan. Rather it provides the basis upon which the sub-precinct draft LEPs and DCPs are to be prepared, and is also intended to provide a more specific level of understanding for the community in terms of the extent and nature development intended to be established within the WELL Precinct over time. It is recommended that Council endorse the refined Concept Plan as the basis for the ongoing development of rezoning plans for the WELL Precinct. Part of the development of the WELL concept planning process has been the preparation of a communications strategy, promoting community and stakeholder engagement in the process. To date, the initiatives have included establishing and updating Council’s WELL website with current information about the progress of the WELL Precinct planning, the adopted WELL Strategy, Council reports, newsletters, and other background information concerning the area. In addition, there have been 3 community newsletters distributed to local residents, media releases and an article in the Mayoral Column. As the Precinct-wide studies are now in essence complete, and a more refined version of the WELL Concept Plan now available, it is timely that our progress in the planning for the WELL Precinct be reported back to the local community. To that end, it is proposed to schedule a resident ‘open day’ information session, to inform the wider community of the planning directions for the Precinct via a visual display and the opportunity for residents to discuss the process with Council’s planning staff. It is also envisaged that a community newsletter be produced and circulated shortly to all property owners and residents in and around the WELL Precinct in the same manner as previous newsletters were distributed to advise of this opportunity. We will also ensure appropriate advertisements are included in local newspapers. We are currently liaising with the stakeholders to arrange the preparation of suitable display material and other information relevant to the open day, including selection of a suitable local venue in the WELL Precinct to conduct the session. Whilst a date for the open day is yet to be selected, it is envisaged that it would be on a Saturday and is currently programmed to occur prior to Christmas. It is also relevant to note that the South Werrington and Caddens Release Area draft LEPs when endorsed by both Council and the Department of Planning for exhibition, will provide a further opportunity for the local community to comment on the development proposals for the Precinct. · Infrastructure Delivery including development staging. These studies will inform the landuse activities, and assist in the development of the specific controls for each sub-precinct LEP and DCP. These draft plans are based on the adopted WELL Strategy and Concept Plan and are currently being prepared. It is envisaged they will be reported for Council’s consideration of endorsement for public exhibition in February 2007. · Completion of the TMAP by end of October 2006 (and seek RTA and MoT approval of TMAP). · Reporting back to local community on the outcomes of the WELL-wide Studies and the refined WELL Concept Plan. · Completion of the WELL-wide Infrastructure Delivery and Funding Plan, as well as the Section 94 Contributions Plan for WELL. · Finalisation of consultation with Government agencies to follow up and confirm planning, servicing and environmental requirements. · Completion of the Caddens Release Area / Precinct Centre and South Werrington Urban Village sub-precinct studies by November 2006. 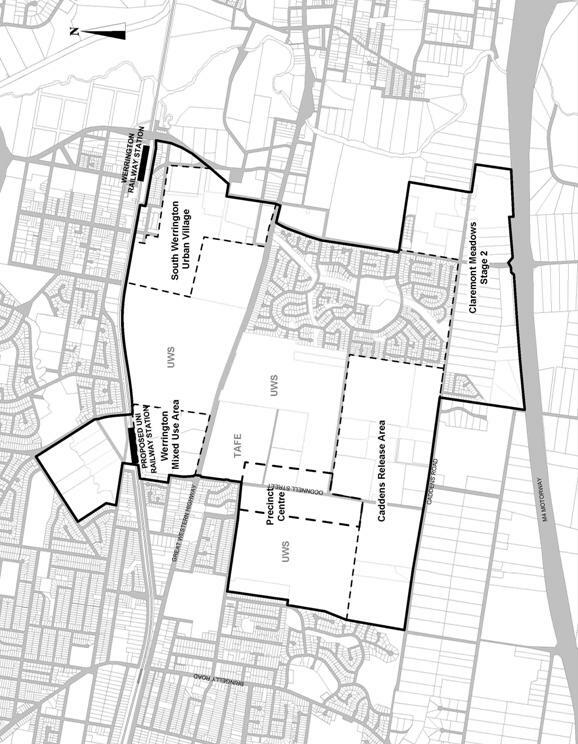 · Preparation of the draft LEPs and DCPs for the Caddens Release Area / Precinct Centre and South Werrington Urban Village sub-precincts for reporting back to Council in early 2007. The adopted WELL Precinct Strategy has outlined a clear framework within which the area’s potential can evolve into quality, sustainable urban outcomes for our City and the Region. The Precinct-wide Studies outcomes have enabled land use activities within the WELL Precinct to be more clearly defined and integrated. This process has generated, as contemplated by the adopted WELL Precinct Strategy, the opportunity for further evolution and refinements to the endorsed WELL Concept Plan. It is appropriate that Council now endorse the refined Concept Plan. The refined WELL Concept Plan informs appropriate land use directions and provides the basis for the preparation of draft LEPs and DCPs for the sub-precincts which are now well under way for the South Werrington and Caddens Release areas. Implicit in the advancement of the LEPs and DCPs is that they conform with the principles of the adopted WELL Precinct Strategy and the refined WELL Concept Plan. Once the current sub-precinct draft LEPs and DCPs have been completed, formal endorsement of the drafts will be sought from Council. It is timely that we report back to the local community on the progress made with planning for the WELL Precinct and it is considered appropriate that an ‘open day’ be arranged and communicated to local residents for that purpose. The identification of infrastructure requirements to underpin the development of the WELL Precinct is advancing and will inform the preparation of developer contributions plans at both the local and regional level to ensure appropriate facility and service delivery. Those strategies will also be brought back to Council early in the new year with the draft sub-precinct plans. It is unfortunate that there remains a difficulty in the State Government clearly reaffirming its past commitment to the delivery of the proposed UWS railway station and we will continue to make submissions to Government to seek a clear direction on this important transport initiative. We have been afforded an opportunity to participate with UWS in its development of a masterplan for the Nepean campus and we will continue to participate in that process and assist the University in its more detailed thinking on the implementation of the WELL Precinct Strategy principles insofar as they relate to the University land holdings. 1. The information contained in the report on Werrington Enterprise Living and Learning (WELL) Precinct be received. 2. Council adopt the refined Concept Plan for the WELL Precinct. 3. Council report back to the community the current progress in the planning for the future development of the WELL Precinct and arrange an ‘open day’ information session for local residents. 4. Further reports be submitted to Council for considering advancement of the public exhibition of draft Local Environmental Plans, Development Control Plans and Contributions Plans for the South Werrington Urban Village and Caddens Release Area in early 2007. The Precinct Centre is located on O’Connell Street. It will be a compact centre, with continuous shopfronts facing O’Connell Street at ground floor level, similar to a traditional ‘main street’. It will also be a diverse place that incorporates typical neighbourhood retail outlets (convenience shopping), community services, small office-based businesses and medium density housing. However, the Centre’s point of distinction will be its role as a ‘front door’ to the adjoining campuses of the UWS and TAFE, seeing these places are now lacking presence in the City. More particularly, the UWS and TAFE will be encouraged to build all non-teaching components (administration and social) of its campus in the Centre. Consequently, it will be a vibrant, ‘buzzing’ anchor for the WELL Precinct that will cater for (and be supported by) not only the existing and proposed residential community, but also the significant University and TAFE staff and student populations. o UWS and/or TAFE student services (including bars, food outlets, bookshop, stationers, etc). It is difficult to determine the extent of demand for the Precinct Centre. However, if it grows beyond the limits outlined above, it should be encouraged to grow northwards towards the proposed UWS Rail Station, with 2-3 storeys of office or residential accommodation above ground floor shops and offices. However, this should not be at the expense of the retail activity within the core area outlined above, which should be maintained to ensure its commercial viability and pedestrian friendliness. Encouraging a high level of integration between retail and non-retail functions throughout the Precinct Centre will provide an animated, safe and compact environment. Different functions can be accommodated within the same building, with education and non education-based services and retail outlets encouraged to mix as much as possible. For example, the University facilities may operate above retail outlets on the ground floor. The potential for community facilities to be shared with local school, university, commercial or other organisations should be maximised. They are best located at the southern end of the centre where they can be integrated with a possible future school, and where they are closest to the critical mass of a proposed residential population. A public meeting place could form a landmark building marking the southern entrance to the Centre. Outdoor dining areas related to cafes and restaurants on O’Connell Street will further animate the public domain. The supermarket, too, will have an active frontage, either through clear glazing or a ‘skin’ of small shops at the street frontage. Both UWS and TAFE are encouraged to establish main pedestrian entrances at the Precinct Centre. This will contribute a strong identity and provide good access for staff and students from each campus into the Centre. Providing direct pedestrian access routes into the TAFE from O’Connell Street north of the Centre is also important to ensure easy access from the future UWS railway station. Opposite the main route to the Centre for Creative Enterprises, a pedestrian route will lead to the University’s Kingswood campus. This will provide a direct route from the Kingswood and South Werrington campuses to each other and to the Centre. East of the creek, it will ideally be addressed by new, active-fronted University-related facilities and potentially integrated with key facilities behind. The buildings on the northern side of the path will need to be distinctive in form and design to provide a landmark at the termination of the route from the Centre for Creative Industries. The Kingswood campus will be encouraged to grow towards the Centre, with new teaching space providing built frontage to the path. Together, this will shorten the length of path not bounded by buildings, increasing its safety. The lighting and landscaping along the path will also be upgraded to enhance its amenity and ensure its safety. A public square could be created at the intersection of O’Connell Street and the path to the two University campuses, to act as the focal point for the Centre and community activity. This location will ensure it is ‘fed’ with a steady stream of activity. More active uses – particularly those that can ‘spill out’ into the public domain, such as cafes, restaurants and bars – will be encouraged to locate on the square, to ensure its vitality. The path from the Centre to the Kingswood campus and University expansion in this area will need to address Werrington Creek appropriately. In particular, buildings should be set back appropriately and sufficient vegetation maintained to promote the survival of this important ecosystem. Landscaping of this corridor may also incorporate ‘University Lawns’ to provide a sunny, open and green space for enjoyment by students and the broader community. The residential component of the Precinct Centre will be apartments, both above the shops on O’Connell Street and adjacent. These will potentially provide affordable housing for local students, nurses, or anyone interested in a live-work lifestyle. New apartment development will also occur at the fringes of the Centre. The additional residents will help to support the Centre’s businesses and services, and improve pedestrian safety by increasing natural surveillance. The apartment developments will also provide an appropriate transition between commercial uses within the Centre and the conventional housing beyond. Ensuring the Centre offers the latest standards in technology will also expand its attractiveness to the market, and best showcase the WELL Precinct and its educational and employment base as a world-leading destination. For instance, wireless Internet nodes could be provided throughout the Centre. The design of the streetscape will enhance the amenity and experience of pedestrians, while sensitively accommodating vehicular access. A central median could be provided along the length of O’Connell Street to slow traffic, provide an opportunity for substantial trees, both greening and contributing to a distinct identity for the centre and, most importantly, to enable pedestrians to cross safely where it is most convenient to them. Appropriate landscaping and urban design approaches, including seating, broad footpaths and verandahs, will further enhance the pedestrian experience. New high-quality bus stops within the Town Centre will cater for existing and proposed bus services. Short-term kerbside parking will provide easy access to local shops and services, thereby encouraging convenience shopping in the Centre by local residents. Servicing of the Centre’s businesses will be facilitated by rear lanes behind the proposed shops, maximising the space available in the main street for pedestrians and parking. These lanes will also provide access to on-site parking for staff and residents. The existing UWS North Werrington Campus has the potential to be a significant new address for higher order employment in Western Sydney, taking advantage of the attractive attributes that the site offers to businesses and investors. This area should accommodate a variety of employment uses and building typologies to maximise its appeal to the market, however it will exclude industry and service businesses more appropriately located elsewhere in Penrith. It could also contain, adjoining at its eastern and western edges, a measure of residential accommodation to support business and to ensure the public domain is active throughout the evenings and weekends. This opportunity is also considered appropriate to extend to the private landholdings to the east of the campus adjacent to the proposed Werrington Arterial link, immediately south of the existing Werrington urban area. The open, green character of the central ridge will be retained to protect the important cultural and environmental value of the ridgeline (see Design Concept 1) and the landscape setting of the observatory, Frogmore House, the cluster of buildings currently operated by the University and the landscaped avenue from the Great Western Highway (currently the University entrance to this campus). New, freestanding buildings will be well-spaced and present attractive facades on all sides to maintain the character and safety of the public domain. In essence they should be ‘sculptures’ in the landscape and be designed to a high level if located on the ridgeline. The nature of the site suggests potential for a wide range of business accommodation to be developed to meet the varied needs of businesses of different types and at different stages in their life cycle. This could include older and newer building stock, multi-tenanted buildings and owner-occupied sites, various building lot sizes, high profile, highway-frontage lots and low profile, secluded lots. In particular, the existing older buildings will provide more affordable accommodation for start-up and embryo businesses, so their retention and reuse is encouraged to foster new, local enterprise. A new road through the middle of the site from French Street to the Werrington Arterial will form a main address. The existing road access from the Great Western Highway and the vehicular and pedestrian connection across it to the UWS South Werrington Campus should remain as the other key routes. A further street will provide access directly to and from Werrington Station. The axis of this street is centred on Frogmore House, recognising its important historic role in the WELL Precinct and providing a legible and visually attractive landmark. The Great Western Highway and Werrington Arterial frontage should be landscaped to contribute to the creation of a distinctive, ‘boulevard’ frontage to the sub-Precinct, with the potential for large landmark buildings that provide a gateway to the precinct being provided at the corner of the Great Western Highway and French Street. New development will back onto the Remand Centre, minimising both its visual impact and its potentially adverse influence on the image of the sub-precinct. New development should address its street frontage in order to enhance the character and safety of the public domain. Access through the site would be significantly enhanced with the introduction of a pedestrian overpass of the railway line, west of the Colonial Hotel on Victoria Avenue (opposite the existing reserve). The vegetation adjacent to the railway line will be retained and enhanced. Development alongside pedestrian paths will provide passive surveillance, increasing safety for users. The pedestrian network will provide an attractive connection to both train stations, to the surrounding residential communities (including those north of the railway line) and to the pedestrian and cycle path proposed along the ridgeline to the south. It should continue east via a cycle and pedestrian underpass beneath the Werrington Arterial to South Creek, to further enhance the permeability and accessibility of the cycle and pedestrian network. The existing University and TAFE Media, Fine Arts and Design programs will provide the focus for the establishment of a creative enterprises hub within the Precinct. This will involve the future development of studios, workshops and associated media, arts and design facilities in close proximity. New development along the ridge will continue in a similar manner to the recent freestanding buildings, for example, the design and performance centre at the southern end of the UWS campus. This respects the open space character of the ridge and will be a continuation of the landscaping solution discussed in Design Concept 1. A new link would be provided south of the TAFE to provide a direct connection to the Centre for Creative Enterprises from the proposed Precinct Centre. Landowners should be encouraged to accommodate functions along this connection complementary to the establishment of an innovative centre for creative enterprises. That could include small studio spaces, workshops, and support businesses to the production and design of new media, fine arts, to facilitate a stronger relationship between arts and business, and reinforce the link to the Precinct Centre ’s facilities and services. It may also include business enterprises, which have a relationship to other activities in the precinct and may include technology development and other innovative product creation. Residential accommodation is also proposed along this route, in the form of apartments incorporated into studio, workshop or small business developments. This will further increase the intensity of activity occurring along this route, contributing to the creation of safer streets, and also the establishment of a thriving and desirable urban living environment closely associated with a world-leading arts community. Connections to the Northern Campus via the existing bridge over the Great Western Highway will be retained and reinforced. Urban villages are proposed around the two train stations to stimulate new investment in high quality housing. The villages will each incorporate a mix of residential and employment uses in a relatively dense form, focused on the railway stations. This will predominantly consist of medium-high density housing along with a small number of convenience shops and cafes, and small workplaces. The streets will provide a permeable and safe environment for pedestrians, offering direct routes to the stations and bus stops. This will result in a vibrant public domain offering a cosmopolitan lifestyle with distinct qualities from that found elsewhere in the Precinct. It will also ensure support for walking and public transport as primary travel modes. The urban village centred on the proposed station at the northern end of French Street incorporates the Werrington Signals Site, for which a draft local environmental plan has been prepared. The Werrington Mixed Use Area plan proposes medium-high density residential development in the northern half of the site, while the southern half is set aside for employment use. It also indicates a small number of local convenience shops located opposite the station. Streets within the masterplan are all fronted by residential dwellings, promoting natural surveillance onto the streets. A linear park runs along the spur of Werrington Creek leading towards the south east of the site. This protects the existing vegetation and promotes conservation and enhancement of the natural creek systems. The creek and adjacent open space areas are also fronted by residential development. An east-west road connection is provided through the centre of the site, which can continue eastwards into the UWS Northern Campus, providing a direct, legible, safe and walkable connection between it and the proposed station. The Department of Defence will retain a portion of the land on the eastern side of Werrington Creek to develop as a Multi User Depot (MUD) for training purposes. The triangular piece of Council-owned land between the railway line and Shaw Park has been identified as being appropriate for medium-density housing, which will enhance the safety of the adjoining park through increased activity and natural surveillance. All new residential development will be required to address its street frontages to create a high quality residential environment and public domain through an increase in passive surveillance and pedestrian activity. The street design will be of a high quality, incorporating generous footpaths and street trees, further enhancing pedestrian amenity. Increasing the housing density around the station will revitalise the quality of the residential environment and accommodate a larger population, which will increase the commercial viability of the railway service, the local shops and small businesses located at the stations, on French Street. The existing neighbourhood around Werrington Station currently accommodates a mixture of housing densities and typologies. Encouraging an extension to the existing community and a mixture of uses, including employment, near the station will help to revitalise the character in this area and assist in creating a robust, healthy urban village. All new development will be required to address the street frontages, to increase the quality of the public domain through increased levels of activity, passive surveillance and therefore public safety throughout the day and into the evenings. It will also provide additional support for existing commercial outlets on Victoria Street, north of the railway station. A high quality pedestrian crossing will be provided to improve public safety, comfort and amenity when crossing the railway line. Vehicular access into this area will be retained in a similar location to that currently provided and will afford good access from the proposed Werrington Arterial. Landscaped, sculptural walls will be installed along the Werrington Arterial to minimise the impact that increased traffic noise will have on the adjoining residential community. Acoustic building design treatments may also be required. This part of the WELL Precinct is designated primarily for residential development. It will offer a wide range of housing types, from large, single dwelling lots, to low-rise attached houses and apartments. The layout of the Caddens Road Release Area will take maximum advantage of the site’s existing natural features to create a highly attractive living environment. In particular, public open space will be provided along the Werrington Creek Corridor, main ridgeline and at other key vantage points and local streets will be aligned to ensure their safety and easy access. The new street network will include a ‘bypass’ of Caddens Road, providing a safer, more direct route to the main destinations within the WELL Precinct, and ensuring that traffic levels along the dangerous stretches of Caddens Road are kept to a minimum. Local street patterns will be designed to respond best to the natural topography, soil salinity and facilitate low impact drainage systems, such as bio-retention swales. Local streets should be designed to provide direct access to a main road and a park wherever possible. The design of new local street alignments will also explore opportunities to provide pedestrian connections to existing street court heads in the adjacent communities to provide improved access and permeability into the WELL Precinct. Residential development will occur in graded densities across the site, with the highest densities occurring in proximity to the Precinct Centre, and adjacent to the Kingswood campus of the University. This places the largest population of people within comfortable walking distance of the Precinct Centre facilities and services, and close to large green, open spaces. Residential development close to the University may also incorporate student accommodation typologies. The lowest densities, large residential lots, are proposed opposite the Orchard Hills suburb along Caddens Road to respect the rural character of this neighbourhood. The remainder of residential development is expected to be more typical residential lots, with higher densities incorporating medium density and mixed-use forms of housing closer to the Precinct Centre and Creative Industries sub-precincts. Public access to key vantage points along the ridge will be retained to ensure that the views are available for public enjoyment and amenity. A consistent landscape treatment is required along the ridgeline to protect important views from the site and to retain its valued open space character. New freestanding development in this location must incorporate attractive facades on all sides to maintain the character and safety of the public domain. Formal public pedestrian and cycle paths will be established along the length of the ridge. These will connect to the Business Park and the existing bike paths along the M4 (via Caddens Road). Appropriate widths and treatments of the ridge are yet to be determined, and will establish the best means to protect its aesthetic, scenic and cultural values. This will be subject to further detailed investigation to ensure its values are protected for the wider public benefit. The Werrington Creek system will also be retained and enhanced throughout this area. This requires that significant setbacks are provided and that care is taken in future to allow this ecosystem to flourish. The incorporation of WSUD responses will further improve the quality of this system. Strategic Program Term Achievement: The City is widely recognised as a centre of cultural diversity, excellence and access. Critical Action: Deliver quality Library Services responding to the community's needs for information, learning and leisure. To purpose of this report is to seek Council's endorsement to increase the Library FTE positions across the various classifications by 2.5. These positions would replace customer service hours currently being worked by casual library staff, effectively reducing the Council's reliance on casual staff for its library operations. This process has the approval of the General Manager. The report recommends Council endorse the increase of Library FTE positions across the various classifications by 2.5. In recent times the Union has been active in identifying the circumstances of library casual staff and the matter has been discussed during this period with Council’s Workforce Development Manager, the Director - City Services and Library Management. The Union has sought to have a number of casual positions converted to permanent part-time. A survey of casual staff in January 2004 indicated that the majority would prefer to maintain their current casual status rather than change to permanent part-time if that change was on offer. Since that time, significant research has been undertaken and a number of options have been canvassed to ensure fairness and equity for all current casual staff. Agreement has been reached between the parties to commence the process of a staged reduction in the employment of casual staff for Council’s libraries. The industrial issue relates to the long time engagement of casuals. It is generally expected that the engagement of casual staff is to fill short-term vacancies or additional workloads. The library has engaged certain staff as casuals in some cases in excess of ten years. The nature of this tenure really leads to permanent employment status. The other issue is as to cost. The Local Government (State) Award has been varied over a number of years to now provide for a casual loading of 25%. As well the Award provides for penalty payments for weekend work. Given the nature of engagement of certain staff in the library on an ongoing basis, it is considered sound industrial relations practice to engage on a permanent basis. This may also assist in regulating rostering arrangements. The introduction of permanent engagement might also be approached on a staged basis to avoid any staff resentment. It is understood that the union would be amenable to this approach. The library has a mix of permanent full-time  and part-time staff [19 = 10.02 FTE] and casual staff [13 + 5 vacant]. All staff are rostered weekly to work in five locations and across the seven days. Casual library staff presently work all hours in the customer service areas with some very limited hours allocated to support duties as and when required. This proposal would effectively convert about one third of “casual” hours to permanent hours of work. New positions would adhere to the award conditions for library staff and be based on the normal working arrangements for part-time staff that is across seven days with working days advertised and stipulated within the letter of appointment. The days and times for each position would be based on management requirements to provide the library’s customer service component. The present award pays a 25% and 50% loading for Saturday and Sunday hours respectively for all staff working a seven-day roster. The positions would be advertised and recruited initially from the pool of casual staff. If positions were not filled in this way, the positions would then be advertised externally. The positions would be maintained at the salary bands and levels currently applicable to casual staff. It is anticipated that this would be the first stage of working toward a sustainable decasualisation of the majority of the casual library staff hours with that process expected to be over the next few years as ‘vacancies’ occur and funding permits. Funding for this first stage will be managed within the library salary budget. 2. Council endorse the increase of Library FTE positions across the various classifications by 2.5. Critical Action: Engage communities within the City more actively in addressing issues that affect them through enhanced community consultation processes. To present the draft Community Participation Manual to Council for consideration. The report recommends that the manual be endorsed as the organsational standard for the implementation of Council's Community Participation Policy. Ken Lim, Organisational Development Coordinator, will provide a brief presentation, highlighting the key elements of the draft manual, the development process and community participation issues raised as part of the work carried out. Council’s Community Participation Policy was adopted in August 2003, followed by the commencement of a supporting staff manual. It was intended that this manual would provide clear guidelines and procedures in the practical implementation of the policy. An initial draft provided to Council officers by an external consultant did not fully meet Council requirements and, due to other competing priorities, the manual was not able to be further progressed at that time. Finalisation of the Community Participation Manual was a task in the 2005-06 Management Plan. A revised and completed draft manual has now been developed, with the assistance of an expert consultant and reference group drawn from key areas of the organisation. Following review of the manual by the Corporate Management Team, it was endorsed and has been provided to managers for use as a standard for relevant consultation and community engagement programs. Council’s endorsement is now sought for that standard and to make the manual available to the public. Copies of the draft manual have previously been distributed to Councillors. It is also included as an attachment to tonight’s business paper. There is no single benchmark for best practice community engagement in local government and many models are in existence. It is worthy of note, however, that the International Association for Public Participation - IAP2 model, which underpins Council’s Community Participation Policy, is an internationally recognised framework used by hundreds of organisations world-wide. The adaptation of this model to Council’s policy is provided on page 9 of the manual. During the development of the draft manual, a considerable amount of research was carried out by the expert consultant and by staff on well constructed, practical and well-utilised community participation guidelines used by councils or government agencies. Based upon this research a number of ideas were incorporated into the manual. Examples from other organisations are listed on page 69 of the manual with relevant websites also referenced. § helping to identify any current gaps and issues in the implementation of the policy. In order to achieve the above objectives, the draft manual is made up of six main parts. Each section is outlined below. This brief introduction explains who the manual has been designed for, how it came into being, and when it should be used. This section explains the Community Participation Policy and covers the minimum statutory requirements for notifying or consulting with the community, the basic rules, how to plan a participation program, the Consultation Matrix, gaining approval for Community Participation programs, accommodating disadvantaged groups, safety issues to consider, and providing feedback to participants. The guidelines cover appropriate levels of consultation, the criteria for success, Penrith City’s community profile, understanding what resources are required to carry out community participation, anticipating challenges and conflict, and evaluation of programs. This valuable reference section describes, in detail, 15 of the more commonly used community participation techniques and tools. This section records 8 ‘real-life’ examples of community participation carried out by Council since 1995. In many of these case studies, methodology is discussed, as well as the successes and lessons learnt as a result. This includes community resources with contact details, a list of relevant Council documents, web resources and other examples of community participation manuals and tools available. Council has an extensive range of community consultation and participation measures in place with a commitment to enhancing this engagement. Establishment of the manual as a standard for the organisation is an important component of advancing this requirement. In the course of developing the manual, a number of suggestions were raised by staff, with the view to improving how community participation might be carried out by Council. These are listed below and are being further investigated. § Specific planning issues relating to s149 certificates - information and fact sheets about common drainage responsibilities, traffic plans. An implementation program for the manual, including proposed enhancements to community participation, is being developed for further assessment by management. Further discussion of these matters with Council will be brought forward in the context of our broader approach to community engagement. A report on the relevant requirements of the Strategic Program and the responses being undertaken will be brought to a subsequent Policy Review Committee meeting. The manual addresses the role of officers responsible for consultations in this regard (page 29). The appropriate action in terms of Councillor notification is still reliant on the judgement of the responsible manager using the Community Participation Policy and manual, however these issues are made much more explicit. The success of the manual will depend heavily on the way it is communicated and understood by the staff generally, and particularly in key departments. Communication with staff to raise awareness of the manual has already begun with a presentation to all managers, posting of the manual on Council’s intranet and an article in the recent edition of the staff newsletter. In addition, the manual will be included in the orientation program for all new staff. § Investigate appropriate means of incorporating the requirements of Council’s Community Participation Policy and Manual into staff training programs. The intensity of communication, and the investment in training, will have a resource implication, and will need to be carefully considered. An assessment is therefore being carried out with key officers and managers to determine a preferred communication strategy, and methodology for staff training, which best serves the above management plan priorities. Communication of Council’s community participation standards to the public, and building a greater level of understanding and confidence, is an important dimension of implementation over time. To begin this process, subject to Council’s endorsement tonight, it is proposed that the manual be posted on Council’s website and that promotion be undertaken to the public of the availability and importance of the Manual. As part of a continuous improvement approach to community engagement and consultation, the completion of this detailed manual as a standard for the organisation represents a significant step. Council’s endorsement is sought for the further implementation of the detailed community participation standards established by the manual and communication of this commitment to the public as well as to staff. 1. The information contained in the report on the Community Participation Manual be received. 2. The Community Participation Manual be endorsed by Council as an organisational standard and be made available to the public. Strategic Program Term Achievement: Services and programs that Council provides are determined based on equity, customer requirements, community benefits and best value. Critical Action: All services are provided to adopted service levels. To provide Council with the draft Service Specifications for the following Services for its consideration - Public Domain Maintenance, Environment Protection and Customer Services. The report recommends that these service specifications be adopted. Given the size of these documents, copies have been provided separately to Councillors. Additional copies of any of these documents can be obtained on request. The report also recommends that the annual budget allocation for Public Domain maintenance be increased from 2007-2008 in line with the increase in the public domain asset base. 2. Enable Council in a fully informed manner to review, and where appropriate adjust, service levels to better meet the needs of the community and align to Council’s strategy (stage 2). Documentation of Council’s 75 external and internal services is a major exercise with significant benefits to the efficient and effective management of the organisation. The program has seen the formal adoption to date of 44 Service Specifications with three additional specifications presented tonight for Council’s consideration. A large body of specifications is approaching completion and will be progressively reported to Council in coming months. The Corporate Management Team has completed a review of the specified services which will result in the amalgamation of some specifications to ensure an appropriate level and grouping of functions, as well as a more ‘plain English’ naming of some services. This will support the introduction in the coming year of a new model of financial and activity reporting of services in the Management Plan. This will be further discussed with Council shortly. Stage 2 of the specification program, Review and Adjustment of Service Levels, has already been undertaken by Council in selected key areas. Important decisions have been taken by Council flowing from these reviews, which have been reflected in the 2005-06 and 2006-07 Management Plans. As discussed in a separate report on organisational issues in tonight’s business paper, a more comprehensive review of service levels has commenced and further information on this will be brought to Council during the year. Prior to their reporting to Council, all draft specifications undergo a rigorous process of validation and assessment, leading to approval by the Corporate Management Team. The aim is to ensure that each specification accurately communicates the existing levels of service and activities that the service provides in terms of quantity, quality and cost to Council. Once adopted by Council, the specification will be used as the basis for testing service performance and for service review, including any changes to services levels, calls for additional resourcing or for changes in priority setting within an existing service. As previously determined by Council, all completed draft service specifications are reported to the Policy Review Committee for consideration and adoption. Where additional information or further consideration is required, resulting in a specification not being adopted at that meeting, the relevant specification would be referred to the Services Review Working Party. This working party would be scheduled to meet as required with its recommendations included in a business paper report to the next Ordinary or Policy Review Committee meeting. Subject to Council’s consideration of revised meeting arrangements, discussed separately tonight, the oppportunity may be identified to streamline the process for Council’s review of service specifications and service levels. Service Specifications are very detailed documents, and in accordance with established practice, full documentation is provided under separate cover to all Councillors, and is available to the public on request. To assist in Council’s consideration of the draft specification submitted tonight, an executive summary of the specification is provided in the appendices to this report. The development of the Public Domain Maintenance Service Specification identified that a major constraint on the level of service provided was the increase in the public domain network as a result of new developments handed over to Council and additional Council built assets. It is recommended that the annual budget for Public Domain maintenance be increased commencing from the 2007-2008 Management Plan by applying the above unit rates (CPI indexed) to the increase in the asset base for each element referred to above. 1. The information contained in the report on the Service Specification Program be received. 2. The specification for the Public Domain Maintenance Service be adopted. 3. The specification for the Environment Protection Service be adopted. 4. The specification for Customer Services be adopted. 5. The annual budget allocation for Public Domain maintenance be increased from 2007-2008 in line with the increase in the public domain asset base. The Public Domain Maintenance Service provides a high level of enhanced maintenance across the City. The Service includes roadway sweeping, selected footway cleaning, litter patrols, cleaning of street furniture, minor graffiti removal, mowing and maintenance to laneways as well as co-ordination of street lighting to improve community safety. TA 11.1 - Maintain and implement a Community Safety Plan for the City with the aid of relevant stakeholders that responds to current prioritised issues. CA 11.1A - Maintain and implement a Community Safety Plan for the City with the aid of relevant stakeholders that responds to current prioritised issues. TA19.1 - Council’s planning policies, land use, regulatory controls and asset management practices enhance the visual amenity of the City. CA19.1A - Develop and implement compliance and regulatory programs to protect the visual amenity of the City. The Environmental Protection Service contributes to the management, protection and enhancement of the environment through inspections, assessments, and monitoring and pollution response programs based upon a strong policy position and commitment to advocacy. TA16.2 - The health of the river system is being improved through the implementation of a comprehensive catchment management strategy. · Protect the environment through effective land use management policies, regulatory practices and appropriate control of development activity. · Improve the health of the river system through the implementation of a catchment management strategy. · State of the Environment Reporting – produced annually. Note : Income from fines (approx $75,000 raised in 2005/06) is transferred to Environmental Reserve for use to offset costs associated with orphan environmental spills and pollution incidents. With a present balance of $80,000, the Reserve was most recently accessed to clean and repair a heavily polluted creek line in Dunheved Estate. TA 31.1 - Services and programs that Council provides are determined based on equity, customer requirements, community benefits and best value. CA31.1C - Deliver quality customer services, responsive to contemporary community expectations within available resources. CA31.1D - Improve community access to Council services and facilities. Compliance with Council’s Customer Service Standards as set out in Councils Customer Service Charter. Strategic Program Term Achievement: Council's operating culture is flexible, efficient, integrated and aligned to Council's strategic objectives and program delivery. Critical Action: A structured program of continuous improvement, based on identifying and adopting leading practice, is operating across the organisation. To provide Council with an update on the status of a number of organisational alignment initiatives. The report recommends that the information be received and the proposed changes to the alignment of certain functions and the restructuring of certain positions be endorsed. As required by the Local Government Act, Council re-determined its organisation structure in March 2005 (within 12 months of the March 2004 election). Since that time the General Manager has reported in July 2005 and February 2006 on measures being taken to align the organisation to the delivery of Council’s Strategic Program. The opportunity for further refinements has also been taken when considering the Management Plan and Strategic Program Reviews. The processes used are based on a consultative approach, and proposed solutions are generally negotiated with affected staff and then submitted for Council consideration. This reflects Council’s approach to its Workforce as articulated in the Strategic Plan. Tonight’s report outlines the status of a number of initiatives being considered as part of a continuous improvement approach to the organisation’s effectiveness and discusses proposed changes to some departmental structures involving the realignment of some Manager and Director responsibilities. The report is in two parts. The first part discusses proposals for changed alignment of accountabilities and seeks Council’s endorsement for them. The second part outlines a range of organisational matters under consideration and is provided for the information of Council. The changes proposed or discussed are an evolving response to current circumstances including the need for succession planning. It is to be expected that other adjustments/refinements to the management structure will continue to take place during the life of the current Strategic Program. The broad principles involved in the main adjustments have been discussed with the relevant Managers. The adjustments are generally unlikely to alter what staff beyond Managers and Supervisors do on a day-to-day basis but it is likely some staff could have different reporting lines. These adjustments need to be properly managed. These changes are about improving the synergies within the organisation and not about cost efficiencies or reducing staff establishments. Discussions will be held with the Joint Consultative Committee, Managers’ group and affected staff as part of the implementation of the changes within Council. The process to formally deal with changes to the Managers positions will follow established workforce policies and procedures. The resignation of Council’s Information Manager and identified considerations around retirement options for Council’s Information Technology Manager has provided an opportunity to review the functional areas of Information Management, Information Technology and Information Systems. Council’s Information Strategy, adopted in 2003, was the result of a comprehensive independent assessment and review of the organisation’s approach to information management, systems and technology in which a number of short, medium and longer term recommendations for improvement were made. The strategy identified the three distinct areas of Information Management, Information Systems and Information Technology and the need for these areas to be centrally co-ordinated. Since 2003, a great many of the report recommendations relating to Information Technology and Information Management have been implemented by the relevant Managers with oversight by the organisational Procedures & Systems Team (comprising the Chief Financial Officer, Director ~ City Services and representatives from Corporate Development, Financial Services, Asset Management, Workforce Development, Legal Services and Internal Audit). The area of Information Systems needs further development. The plan of action involving integration of key business systems and, importantly, associated procedures to achieve best value needs greater attention. There is considered advantage at this time, given the emerging importance and priority for the effective management of information, to restructure the current Information Manager position to the position of Information and Technology Services Manager. That position would be responsible for the Information Manager functions outlined above (apart from Libraries which is discussed below). The Information Technology Manager will continue to deliver Information Technology services until the incumbent retires. Further, given their corporate focus a more effective strategic alignment of issue responsibility for the Information Management and Information Technology functions is with the Chief Financial Officer. The Information Technology Manager and the Information and Technology Services Manager would report to the Chief Financial Officer. It is not uncommon for the Information Management and Technology function to report to the CFO or a senior staff member with corporate responsibilities. The NSW State Government's Office of Information and Communications Technology has issued guidelines on the role and responsibilities of a Chief Information Officer that suggest this position reporting to the "executive head of operations" is a suitable reporting relationship. The proposed relationship is consistent with this given the Chief Financial Officer's existing financial, management planning, service specification, risk management and property responsibilities. The immediate priorities of the newly appointed Information and Technology Services Manager would be to lead a Procedures and Systems Team Review of the Information Strategy including plans of action for Information Management, Information Systems and Information Technology. The Manager would also review the functional areas allocated to the position to identify improvements to organisational alignment. Subject to Council’s endorsement of the proposed realignment of the Information Management functions outlined above and the required consultative processes being undertaken the new position of Information and Technology Services Manager will be advertised. The Library is a flagship operation of Council providing an important service to the community. Subject to Council’s endorsement, it is proposed for this status to be recognised by affording this service Department status having a direct reporting line to the Director ~ City Services. The position of City Librarian would therefore be re-evaluated to take into account its Manager status and consequent responsibilities for staff, budget and service delivery. The accepted organisation processes will be followed to achieve this direction. § a changing industrial relations climate including the dramatic industrial relations changes through the new workchoices legislation. § regular internal staff satisfaction surveys. The development of the Workforce Strategy, led by the Workforce Development Manager and Personnel Services Manager, will review the wide range of current and potential workforce and workplace policies and procedures, many of which could be considered leading practice. The Strategy will underpin Council’s goal for its workforce and workplace to match contemporary and emerging organisational needs and requirements. Importantly it will contribute to making Council an ‘employer of choice’. A particular emphasis has been placed by Council in the new Strategic Plan on addressing the needs of distinct places in the City-: not only new urban release areas but established areas, our City Centres, employment lands, rural areas, and natural catchment. In recent years also the concept of public domain management has increasingly emerged in Council’s agenda. A useful approach, put in place in July 2005, to ensure that the requirements of the Strategic Program were met was to group or ‘cluster’ Term Achievements around the Issues and form appropriate teams to drive their delivery. The role of Term Achievement Cluster Teams was discussed in the Organisational Alignment report considered by Council in February 2006. The consideration of Term Achievements identified that a ‘Place Management’ approach needed to be taken to the management of certain ‘Clusters’, while a functional management approach is quite appropriate in others. Each group of Term Achievements has a Manager to head the team accountable for their delivery, under the leadership of the Director responsible for each Issue. In most cases, all Term Achievements within an Issue are assigned to one grouping. In certain instances, however, a more logical grouping has been achieved by the Term Achievements in an Issue being placed in more than one ‘cluster’. This framework will be the subject of a future report to Council including how the coordination and implementation of place based strategies are to be resourced. Given the recent adoption of the St Marys Town Centre Strategy and Penrith City Centre Strategy and the work of the Department of Planning’s Cities Taskforce there is a need to provide staff resources to drive the implementation of the Strategies including liaison with government agencies, landowners and development proponents. We are exploring funding opportunities from both Council and State government sources. Effective governance arrangements are crucial for maintaining the integrity and reputation of Council and its organisation. Council’s Strategic Plan, Program and Management Plan clearly reflect this in the Term Achievements, Critical Actions and Tasks to address Issue 30 - Governance. At the present time governance policy and procedures are coordinated through a cross-organisational Corporate Governance team comprising the General Manager (Chair), Chief Financial Officer, Director ~ City Services, Legal Officer, Internal Auditor, Executive Officer and Risk Management Coordinator. The current Management Plan contains a number of tasks which seek to improve governance standards and practices and the enterprise risk management framework. This work also includes the review of controlled entities and clarifying the role of Councillors in the discharge of Council’s charter. A proposal to establish an Audit Committee has been discussed by the Finance Working Party and a report will be submitted for Council’s consideration shortly. In addition the General Manager has recently reassigned the Public Officer role from the Director ~ City Services to the Executive Officer. Given Council’s strategic objectives for the Governance issue and the need for organisational succession planning it is timely to review the management arrangements supporting the delivery of the Governance functions across the organisation. The Review is to be led by the General Manager. It will have the aim of ensuring that Council remains at the forefront of leading governance practice. The progress of the review will be reported to a future meeting of the Policy Review Committee. Services Improvement is being addressed in a two stage process which commenced nearly four years ago. The first stage Services Specification Program identified 75 services. Council has to date approved the specifications of 45 services. It is now anticipated that the number of services will be consolidated into 68 larger services. The specifications for the remaining services are programmed to be completed in the current year. To bring about immediate benefits, all services will undergo an initial desktop review over the next 12 months, focusing on financial efficiency, sustainability, access and equity, risk management and the customer focus/service environment, people and systems. The rationale for this approach is to maintain momentum during the review process and to dovetail into any pre-existing programs (such as the service-based risk assessment program) and concurrent functional reviews. The revised meeting cycle considered elsewhere in tonight’s business paper will provide the opportunity for the Policy Review Committee to give focussed consideration to the progress of the Services Improvement and Review. They all have direct or indirect benefit to the community, the organisation and the City as a whole. The role Council can have in these events range across being the provider, the funder, the advocate, the facilitator, the promoter, the creator, the evaluator, the monitor, and the like. The present responsibility for these events is across a number of departments. Given their important role for Council, the delivery of these functions could be significantly enhanced by streamlining responsibilities. A review is underway of the present alignment of accountabilities to achieve this end. A review of engineering services is being undertaken in response to the industry wide circumstances facing the recruitment and retention of engineering professionals, the need to provide for succession planning and to support Penrith’s Regional City role. The review will now be concluded with the benefit of input from the new Director ~ City Operations when appointed. 2. increasing the critical mass of engineers by drawing together existing small units. The Director ~ City Planning has transferred the Subdivision function from the Environmental Planning Manager to the Development Services Manager and proposes to transfer those development engineering functions which are the responsibility of the Environmental Planning Manager to the Design and Technical Advice Manager. Consideration is being given to the location of traffic, road safety and transport functions. 5. providing effective urban design services to support the regional growth, place management and planning policy development functions. The necessary staff consultation processes will be undertaken prior to finalising any changes. Council has placed emphasis on adjusting the organisation’s structure and operation to keep it moving forward and well placed to achieve Council’s program. Preparing the organisation for the future and particularly with regard to the readiness for generational change is a key focus in Council’s Strategic Plan. This report advances the consideration of organisational alignment initiatives. The initiatives discussed are advancing those objectives and presenting opportunities for staff to operate in a more strategic way bringing benefits to career development as well as to Council’s program. Council’s endorsement is sought for the assignment of the Information Management and Information Technology functions to the Chief Financial Officer and the restructuring of the Information Manager and City Librarian positions. The necessary staff consultation and job evaluation processes will be undertaken. 1. The information contained in the report on Alignment of the Organisation be received. 2. The proposed changes to the alignment of Information Management and Information Technology functions and the restructuring of the Information Manager and City Librarian positions as detailed in the report be endorsed. To discuss the development of a more efficient calendar of meetings and functions having regard to Strategic Program requirements and other drivers. The report recommends that Council adopt a three-week rolling cycle of meetings to be held on Monday nights. The report also recommends a later start time of 7:30pm for meetings. This report provides an overview of Council’s current meeting and decision making processes, and details the role that each of these processes has in providing relevant information, to assist the Council in making informed decisions in the best interests of the Penrith community. The report recommends that consideration be given to moving to a three-week cycle for Ordinary and Policy Review Committee Meetings, with the third week in the rolling cycle being available for Councillor briefings and working parties, if required. In December 2005, the State government announced, as part of the Metropolitan Strategy, that Penrith would play a key role in Sydney’s future in the global economy, as one of three regional ‘River’ Cities, together with Parramatta and Liverpool. It is anticipated that the Metropolitan Strategy will result in the State government taking more positive action to implement programs for Penrith’s growth and economic development, consistent with Council’s own objectives. This will require consideration by Council of several major strategic land use planning and related policies, particularly over the next two years. Council’s meeting schedule will need to take into account this increasing shift to policy related decision-making. Council’s current meeting cycle consists of two Ordinary Meetings per month, on the first and third Monday, and one Policy Review Committee meeting held on the fourth Monday. The second Monday is available for workshops, working parties and Councillor briefings, as required. This cycle has been in place since July 1994, following the disbandment of the Services and Administration and Planning and Works Committees, and the reconstitution of the Review Committee as the Policy and Review Committee (now the Policy Review Committee). It should be noted that the Council makes its decisions at one meeting process, being the Ordinary or, less often, Extraordinary Meetings of the Council. These meetings deal with those matters required by the Act that cannot be delegated, including the adoption of the Management Plan, financial matters, fees and charges, tenders, property sales and purchases. The function of Committees is to consider matters directly related to their objectives and make recommendations to Council. The Policy Review Committee (PRC) is the principal forum for consideration of policy and other issues in depth. It has also become the forum for detailed presentations by external parties, and this has led to an increasing need to limit and re-schedule items, due to the limited number of PRC meetings available. Each of the other meeting processes (Councillor briefings, working parties, field inspections) are applied as information provision and information exchange sessions. An analysis of the number of reports, and duration of both the Ordinary Meeting and the Policy Review Committee from January 1997 to May 2006, has been conducted to see if there are any trends that could assist with a re-evaluation of the current cycle. There were 202 Ordinary Meetings held between 3 February 1997 and 15 May 2006. The overall average number of reports submitted to the Ordinary Meeting for this period was 21, while the overall average duration was 2 hours 25 mins. The trend for the Ordinary Meeting, in terms of both the number of reports and meeting duration is shown on Tables 1 & 2. There were 86 Policy Review Committee Meetings held between 10 February 1997 and 22 May 2006. The overall average number of reports submitted to the Policy Review Committee for this period was 6, while the overall average duration was 2 hours 19 mins. The trend for the Policy Review Committee, in terms of the number of reports and meeting duration, is shown on Tables 3 & 4. Further, if the 15 Ordinary Meetings and 7 PRC Meetings held so far in 2006 were considered in isolation, the average meeting length would be 1 hour 31 minutes and 2 hours 14 minutes respectively. This supports the view that there is a current need for more opportunities for policy related decision-making. In addition to the Ordinary Meeting and Policy Review Committee, Council operates through, or has representation on, a number of internal and external committees and boards. “A council can hold a workshop (sometimes called a briefing session) under its general powers as a body corporate. Workshops are informal committees and can provide useful background information to councillors on issues. A workshop may involve councillors, council staff and invited participants. Workshops should not be used for detailed or advanced discussions where agreement is reached and/or a (de-facto) decision is made. Any detailed discussion or exchange of views on an issue, and any policy decision from the options, should be left to the open forum of a formal council or committee meeting. Councillor Briefings have been held as needed, since late 2004, to provide useful background information on issues that are likely to come before the Council for decision. Steps have been taken to ensure that Councillor Briefings/Workshops are not used for detailed or advanced discussions where agreement is reached and/or a (de-facto) decision is made. A draft Charter for Councillor Briefings has been developed, a copy of which is attached (Appendix 1). It is suggested that Council’s Code of Meeting Practice be updated to include protocols for their operation. One factor that should be clarified is whether the Council requires that declarations of interest, whether pecuniary or not, have to be declared at Councillor Briefings. Further advice will be sought in relation to this as part of a review of Council’s Code of Meeting Practice. It is also suggested that all meetings, including informal Councillor Briefings, be held on Monday nights, or the main night Council conducts its business as determined from time to time. Field Inspections have been recently re-established and are to be conducted on Saturday mornings; the next one is scheduled for 11 November. Councillor feedback after recent Field Inspections was positive, but with the caution that they not be held “too often”. Four Field Inspections per year would seem an appropriate number. Council hosts a number of civic receptions and citizenship ceremonies in the evening, throughout the year, and where possible these are held on Wednesdays to avoid conflict with Councillors’ other commitments. These functions play an important role in engendering community spirit by recognising sporting, cultural and academic successes. No change is suggested to this arrangement, other than to ensure that Wednesdays are kept free of meetings, providing a clear distinction between “business” and “celebration”. Best practice for the effective management of meeting arrangements, and use of Councillors’ time, suggests that consideration should be given to arrangements that increase the effectiveness of Councillor contributions, by reducing the demands on their time. Inquiries with Blacktown, Campbelltown, Fairfield, Parramatta and Wollongong Councils, both by phone and through their websites, indicate that these councils use a variety of meeting cycles and committee structures, through which specific matters, relevant to the respective committee’s terms of reference, are debated before a recommendation is made to a council meeting. A summary of this research is attached as Appendix 2. A meeting cycle which allows meetings, briefings and working parties to be held on a consistent schedule, reduces the demand on Councillors’ time to one night per week for these types of forums. This in turn provides a greater opportunity for Councillors to celebrate community achievements by attending civic functions which would be scheduled for Wednesday nights as needed. Option 3 above appears to have the greatest relative advantage, in terms of providing a balance between maintaining customer service in relation to DAs and additional opportunity for Policy Review Committee meetings. This option also provides additional opportunities for Councillor Briefings on the main meeting night (currently Monday) without the need to hold these on other nights during the week. The trends shown in Tables 1 & 2 above, in relation to the Ordinary Meeting, indicate that fewer Ordinary Meetings could be held, the current trend indicating fewer reports and shorter meetings. The current cycle of two Ordinary Meetings per month could be reduced to one meeting every three weeks, and this would have less impact on customers requiring a decision of the Council (such as applicants for development consent) than a cycle that provides only one Ordinary Meeting per month. If held on a three-week rolling cycle, the number of Ordinary Meetings would decrease from 20 (in 2006) to 14 (proposed 2007). The trends shown in Tables 3 & 4 above, in relation to the Policy Review Committee, indicate an increase in the number of reports, while the duration of meetings is marginally down. If, however, the Policy Review Committee was seen as the appropriate forum for the presentation of the Management Plan quarterly reviews and Strategic Program progress reports, more frequent meetings would be required to ensure their duration does not become unmanageable. If held on a three-week rolling cycle, the number of Policy Review Committee meetings would increase from 9 (in 2006) to 13 (proposed 2007). The three-week rolling cycle also allows for Councillor Briefings to be held on Mondays only, without the need to use another night and if not required, the date could be kept free. In the months of March, April and May, the dates shown as Councillor Briefings would be used for the Management Plan Councillor Workshops (March and April) and Public Forum (May). This three-week cycle provides a structure within the organisation that is in keeping with the objective of restricting all meetings to Monday nights, and avoiding Councillors becoming run down by extra meetings being scheduled on an ad-hoc basis. The current 7.00pm start time for both the Ordinary Meeting and Policy Review Committee sometimes creates difficulty for some Councillors and members of the public to attend on time. This is due at least in part to the need for a significant number of residents to commute to work. A possible alternative is to start the meetings at 7.30pm and make dinner available from 6.30pm. This slightly later start time would create a greater opportunity for Councillors and residents to attend the meetings, and would be in keeping with healthy work practices, by avoiding the situation where a full meal is eaten late at night. Provision could also be made for a light (healthy) supper at the conclusion of the meetings. When considering any changes to the current cycle of meetings, priority has to be given to balancing the need to advance the many matters requiring Council’s attention, with a high degree of sensitivity to Councillors’ capacity to attend these meetings, while maintaining their commitment to family, business and social contacts. It is equally important to ensure that Councillors do not become so run down by the cycle of meetings that they are unable to also celebrate community achievements by attending civic functions. A rolling three-week cycle, as discussed in this report, is the suggested option for achieving these objectives. Wednesday is to remain the preferred day for civic functions and citizenship ceremonies, allowing Councillors the opportunity to celebrate with their community. Subject to Council’s adoption of the recommendations of this report, action will be taken to publicise the changes in the local media, on Council’s website, and directly to all households through Council’s quarterly community newsletter. 4. Council adopt the draft Charter for Councillor Briefings attached to this report. To report on the outcomes of the discussion of the Strategic Program Annual Review at the Policy Review Committee meeting 11 September 2006. The report recommends that the information be received. At the Policy Review Committee meeting held on 11 September 2006, Council considered and discussed a report on the first Annual Review of the 2005-2009 Strategic Program. The report recommended some changes to Director Accountabilities, Term Achievements and Critical Actions and was supported by a comprehensive progress review booklet. Council endorsed the recommendations of the report. The meeting received presentations from the General Manager and Directors on key issues and challenges for the delivery of the Strategic Program. A summary of the presentations is provided in tonight’s report. In addition, a memo has been provided to Councillors outlining the status of all those matters which were raised by Councillors during the discussion of the report. The report detailed progress in the first 12 months of the four-year Strategic Program. The focus was on how the organisation is delivering those outcomes chosen by Council. While the Program is, by and large, on target, there are some issues of particular challenge – some carried over from the previous Program and some where we have not yet “broken through”. These areas included the Penrith Valley Marketing Centre concept, development and implementation (with Government) of an Integrated Landuse and Transport Plan, public transport improvements, Plans of Management for Nature Reserves and the preparation of a Floodplain Management Plan. ·· Equipping and managing the organisation to deliver Council’s program effectively in a context of generational change in its workforce, increasing demand for services from Local Government and increasing insistence for local communities to be more involved in decisions which affect them. · housing for the aged. All of these key themes and priorities were addressed by the Directors in their presentations. The Chief Financial Officer provided a detailed overview of the Percy Allan inquiry into the sustainability of local government and the implications for Council. The report recommends a mixture of borrowings and revenue raising to address infrastructure renewal. Others areas addressed were public perception, cost shifting, service delivery, development planning and control, revenue measures, governance, management and sustainable finances. A copy of the presentation was provided to Councillors. It also serves as background material for Councillors attending the forthcoming Local Government Association Annual Conference. The Director ~ City Strategy discussed the challenges in engaging with our Regional and City partners and our communities. As part of our sustainability leadership, the Strategic Plan and Program will more strongly incorporate the United Nations Environment Program (UNEP) Principles. Work has begun on developing a contemporary workforce strategy to address workforce age and skills profile and to make Council an ‘employer of choice’. The Director ~ City Services spoke about the challenge of integrating Council’s information systems and technology. The Director ~ City Operations discussed emergency management and the need to work to overcome the division of responsibility for primary rescue response. While funding has been secured from government for the Integrated Land Use and Transport Plan, it will be a challenge to engage relevant State agencies in its preparation and delivery. Improved funding programs are leading to the sustainable management of the City’s road, open space and public building assets. Graffiti management remains a key challenge, as reflected in the AREAS special initiative in Council’s 2006-07 Management Plan. The Director ~ City Strategy discussed the challenges with making Penrith Valley an iconic destination, including attracting an international event and issues around the Nepean River and Penrith Lakes. In regard to the Lakes development, ongoing management and funding is unresolved. Following the adoption of the City Centres strategies, work is underway with the Department of Planning’s Cities Taskforce to prepare the detailed plans for Penrith City Centre. The implementation of the strategies, and negotiating desired outcomes for key Council and private sites, will be a challenge over the next few years. Regional growth remains a challenge, especially the need to secure orderly development and jobs delivery to meet both local and regional needs. The Director ~ City Planning discussed the challenging planning program ahead for the Local Plan, release areas, the residential strategy review and the redevelopment of older areas. Securing the timely provision of infrastructure, such as the Werrington Arterial, UWS railway station and the Erskine Park Employment Area link road to the M7 Motorway, is a challenge for realising Council’s desired outcomes for a number of the new development areas. The Director ~ City Services discussed the challenge of delivering quality children’s services in an operating environment where there is growing competition from private sector providers. He also discussed cultural development issues. The Director ~ City Planning discussed the challenge of community wellbeing, including improved equity, evidence based decision making, liveability and improved health outcomes. The Director ~ City Operations discussed the development of the new community safety plan and related issues including the ongoing challenge of graffiti management. The General Manager and Director ~ City Strategy are meeting regularly with Directors to further develop responses to the challenges outlined in the presentations. These are the focus of the Term Achievement Cluster Teams of Directors and Managers (discussed in a separate report in tonight’s business paper on key organisational issues). Reports will be brought forward to Council recommending appropriate courses of action in the coming months. That the information contained in the report on the 2005-2009 Strategic Program Annual Review be received. To provide Council with a background to, and current status of, development committees that currently operate for new residential developments in the City. The report recommends that the information in the report be received. Councillor Greg Davies has requested a report on the effect that Development Committees (Design Review Panels) have, or will have, on Council. Engaging with the development industry at an early stage presents the opportunity to promote better design outcomes and a more efficient development assessment process. Council currently engages the development industry through the Development Advisory Panel, which has been functioning for a number of years. The Panel comprises senior staff from appropriate sections of Council and it aims to identify and, if possible, resolve issues “up front” ahead of the submission of a development application. The Panel is an effective tool for communicating Council’s expectations for development outcomes, and our experience has been that it facilitates efficient processing of the application. Applicants for development proposals (other than dwellings and ancillary buildings, minor commercial or industrial additions/alterations, use/occupancy of buildings, minor rural development or advertising signs) are encouraged to submit their proposals to the Development Advisory Panel. Two recent major developments in Penrith, Twin Creeks and Waterside, are being delivered under the Community Titles legislation, which offers an alternative to conventional or strata subdivision. It combines the benefits of land ownership provided by conventional subdivision, with the communal responsibility for shared facilities that strata subdivision entails. It also enables master-planned developments to be designed around a “theme” and delivered in stages. The ‘theme’ includes tight regulation of dwelling form, style, location and materials of construction. It is most often a requirement that the developer/community association approve housing proposals prior to the submission of a development application to Council. The developers of these two estates have separately sought additional input to the housing design and approval process through the establishment of Design Review Panels (DRPs). These panels provide the developers, and later the community association, with the ability to ensure the urban design initiatives or “theme” of the estate are maintained throughout development and marketing of the site. These Panels do not replace Council’s Development Advisory Panel. Twin Creeks is a 320 hectare master-planned, residential estate comprising 177 lots, located around an 18 hole golf course. Development of Twin Creeks is controlled by a site specific Local Environmental Plan (LEP) and Development Control Plan (DCP), supported by a Masterplan, Pattern Book and a Building, Siting & Design Code (Design Guidelines). These documents seek to ensure the final built form delivers “resort style living amongst contemporary homes set discreetly and harmoniously within a truly beautiful landscape” (the “theme”). The developer has established a DRP to ensure individual houses conform to the design standards contemplated by the Building Siting and Design Code. The Panel reviews and endorses all house designs prior to submission of the development application to Council. Council was not initially represented on the Panel. Several earlier development applications submitted for houses in the Twin Creeks estate, and approved by the Design Review Panel, did not comply with Council’s adopted DCP. This caused considerable difficulties for applicants and Council during assessment of the Development Applications. To address these issues, Council has sought and achieved participation in the developer’s DRP, with the view to early identification and inclusion of Council’s requirements in the preparation of initial proposals. This has resulted in a more complete and accurate development application, minimising processing times through Council. A fee of $160 per application is paid for Council’s involvement in the DRP. This fee allows for two meetings and travel to the site. An additional fee of $50 is required for any subsequent meetings. Development of Waterside is controlled by a site specific LEP and DCP, supported by a Masterplan and set of Design Guidelines. These documents seek to ensure the final built form delivers “a new community setting the highest standards in social, economic and environmental sustainability together with new bench marks in urban design and housing” (the “theme”). Stockland’s Housing Delivery Strategy is based on a mix of detached and attached dwellings on lots ranging in size from 220m2 to 887m2. Purchasers can buy a completed house and land package (lots <300m2), purchase land and choose a Council approved housing design from one of 3 partner builders (lots >300m2 and <450m2), or purchase land and build a home of their choice (lots >450m2). Stockland offer a $5,000 construction rebate to encourage people who purchase lots >450m2 to choose one of their 3 partner builders to design and construct their home, as these builders have considerable experience in designing dwellings that comply with the guidelines. · The first step is a contractual arrangement between the developer and the property owner that requires overview of housing proposals by a DRP. The DRP was established by Stockland to provide the developer and residents of the estate with an opportunity to ensure house designs are consistent with the estate “theme” prior to submission of a Development Application (DA) to Council. Council is not represented on the DRP. · The second step involves submission of a formal development application to Council, a statutory requirement, where staff ensure the proposal complies with the respective LEP and DCP requirements. The principal difference between the housing delivery strategies for Twin Creeks and Waterside is that, at Waterside, 55% of the lots are marketed as a house and land package. As is the case for Twin Creeks, housing on the remaining lots is required to comply with the provisions of the DCP and Design Guidelines. However, the distinction between Twin Creeks and Waterside for these lots, is that at Waterside, Stockland offer a $5,000 construction rebate to encourage people to choose one of their 3 partner builders to design and construct their home. · Confidence for existing residents that future development will meet their expectations. The success of this process depends on the property owner understanding the function and purpose of the DRP. It is the clear responsibility of the developer and ensuing community association to ensure that property owners understand that obtaining approval from the DRP is simply a “peer review” of their proposal, not the statutory approval (development consent) required from Council. Stockland understand and embrace this responsibility in the development of Waterside. Enquiries at Blacktown City Council reveal that Australand & Landcom have recently approached the Council to establish a DRP for a development at Second Ponds Creek in the Parklea Release Area. The Panel will include Council representation (senior staff member) but has not yet been convened, as housing development has not commenced. Housing form is controlled by a DCP and a set of Housing Design Guidelines. Individual homeowners will submit their house design to the DRP for approval prior to submission of a DA to Council. The delivery mechanism for this estate is similar to that of Twin Creeks. Liverpool City Council has advised that developer initiated DRPs have been established for a Landcom development at Hoxton Park and a new development at Moorebank by Boral. These are master planned estates, generally with established building footprints, where housing design is controlled by a set of Design Guidelines. A senior Council staff member has been appointed to each DRP. Individual homeowners submit their house design to the DRP for approval prior to submission of a DA to Council. Liverpool City Council is supportive of the process, as they consider it assists a better design outcome and DA processing times, as it has allowed Council to exempt development from the notification process, where building footprints have been identified at the masterplan stage. The delivery mechanisms for these estates are similar to Twin Creeks. Baulkham Hills Shire Council has experienced developer initiated DRPs in Norwest Business Park and “Hunterford”, a multi-unit housing development on Pennant Hills Road, Oatlands opposite Kings School. A senior Council staff member has been appointed to each DRP. Developers submit their building design to the DRP for approval, prior to submission of a DA to Council. Development of each estate is controlled by a LEP, DCP and a set of Design Guidelines. Council indicated they are supportive of the DRP process for Norwest Business Park, as they consider it a pre-lodgement facility that provides an early opportunity to engage in the design process. This process appears to operate in a manner not dissimilar to our Development Advisory Panel. “Hunterford” is a community titled estate developed by Landcom in association with a 3 member Builder team. The DRP was established to review applications from the Builder Team prior to submission of a DA to Council. It allowed the Developer to hear Council’s comments, and check compliance with the Design Guidelines, prior to granting owners consent to lodgement of a DA. Council was of the opinion that the DRP assisted a speedy approval and consistent development outcome. The delivery mechanism for the “Hunterford” estate contains aspects of both the Twin Creeks and Waterside strategies. It is similar to Twin Creeks in that development is guided by a suite of guidelines (LEP, DCP & Design Guidelines) and utilises the selected builder team aspect of Waterside. However, it does not utilise the approval of house designs at the subdivision stage, or the financial incentives to use a member of the selected builder team, intrinsic to the Waterside delivery strategy. Kristin Tomkins, Acting Executive Director, Building Policy has advised the HIA would not generally support the establishment of DRPs as they are fundamentally another layer of approval. · The panel typically comprises a designer, landscape architect and possibly a Council representative. The development assessment process is complex so measures that improve certainty of the outcome are considered to be worthwhile. When the Twin Creeks development was approved, there was a substantial amount of “design guideline” information that needed to be considered in the pursuit of any future development within the estate. These guidelines were attached to individual lots by way of Section 88B Restrictions as to User, in accordance with the Conveyancing Act 1919. It was incumbent on future developers/owners to consider this information ahead of any agreed dwelling design. The establishment of the Twin Creeks Design Review Panel was a mechanism where these considerations could be resolved ahead of lodgement. They are considered to have an important role in the management and consideration of new applications, and where issues have been identified early, applications have resulted in a more efficient turn-around time. Waterside however, is being developed with a very distinct design outcome built into the site masterplan. Many of the lots created are accompanied by agreed house designs at the time of subdivision. Those that are not, are required to satisfy agreed performance criteria to support and underpin the objectives of the estate. Unlike Twin Creeks, a significant proportion of lots in the Waterside estate comprise lots with pre-approved dwelling designs. However, it is considered that DRPs can play a positive role in expediting the development assessment process where there are multiple owners of the estate and housing designs have not been established at subdivision stage. The Design Review Panels currently operating in the City have been developer driven initiatives, relating to two residential estates being delivered under Community Titles legislation. The Panels enable developer overview of housing proposals to ensure compliance with the masterplan “theme” for the estate, and are a contractual arrangement entered into between the developer and the purchaser. They are an advisory facility that may promote better design outcomes for residential estates under single ownership. However, they are additional to the statutory assessment and decision-making processes of the Environmental Planning and Assessment Act, which are Council’s primary responsibility in the development and delivery of estates. Council’s participation in the Twin Creeks Design Review Panel has been necessary to clarify the Panel’s role as an advisory body, and has had the benefit of delivering more complete and accurate development applications for Council’s assessment under the statutory process. · A financial incentive for purchasers to use one of the partner builders to design and construct their home for those lots where house design has not been approved at the subdivision stage. The current Design Review Panel procedures for each estate are now serving a useful function in the assessment of development applications and should continue in their current form. However, our experience and that of adjoining Councils, the HIA and UDIA do not demonstrate that developer driven DRPs need to be promoted for all release area developments. None the less, this opportunity will be discussed with release area developer groups as projects come to delivery stage. That the information contained in the report on Development Committees be received. Strategic Program Term Achievement: Council provides adequate resources to deliver its program and has introduced measures to increase its capacity. Critical Action: Maximise funding opportunities to deliver Council’s program. To provide Council with an update on the activities of the Grants Support Officer (GSO) from October 2005 to September 2006 and to recommend extension of this twelve-month temporary position for a further twelve months to October 2007. The GSO’s position encompassed two roles: the first, a focus on increasing Council revenue from grants; the second, to increase the number and value of grants going to the Penrith community. On Monday 10 October 2005, Ray Richardson commenced a twelve-month temporary appointment as GSO, located within Financial Services, which expired 9 October 2006. A Grants Reference Group was established to provide guidance to the GSO. Three managers other than the chair (the Financial Services Manager) volunteered to be part of this group: Community Development Manager, Environmental Health Manager and Waste and Community Protection Manager. The impact of the appointment of a GSO on increasing revenue to both Council and the community will only be assessable in the long term, because of the lead time required to identify suitable grant programs, and the time that expires between application submission deadlines and receipt of advice on decision making processes, then acceptance of the grant and receipt of funds, before a funded project can commence. This process in some cases has extended beyond one year. In the first 12 months in this role, the GSO has concentrated on establishing strategies and protocols, establishing an intranet site for staff reference, and a web page for the community’s information, developing databases, acquiring resources, and exploring existing networks. This approach is in line with best practice recommendations on grants and grant accounting. A detailed report on the work program was made to the Ordinary Meeting 7 August 2006. Since that time the GSO has continued to provide advice and assistance to both Council officers and community groups, including Nepean Riding for the Disabled, Penrith Christian School, Mini Moto Club and Sydney Society of Modelling Engineers. The grants information contained on both the intranet and Council’s web page remains a valuable resource and is kept updated. Analysis of success rates for attendees at the first two workshops run jointly by the GSO and Community Development in the CDSE round recently announced, revealed that 68 representatives from 46 organisations attended the workshops; 20 of these organisations submitted 33 applications. Of these, 14 organisations (70%) received funding: a result much better than average (applicants who did not attend the workshop had a 42% success rate). Of their 33 submissions, 18 were successful (55%), again better than the average across all applicants. GROW Sydney ACC has been promoting these community workshops as a model for developing skills in the community to other councils. A workshop on preparing grant submissions, in association with Council’s Community Projects Officer (WSAAS), for community groups, was held on 29 September. Ten people representing eight organisations attended the workshop. The process for grant applications by staff has been streamlined (Council policy FS022and a number of flow charts developed to clarify processes for staff. This chart covers the process from identification of a grant program to the point where a Manager decides whether to apply or not apply for a grant. This chart covers actions from the decision to apply for a grant program, through authorising the application and receipt of the funding authority’s decision. This chart covers the procedures to follow when Council is requested to auspice a grant on behalf of an individual or community group. This chart covers the process from receipt of advice that a grant has been approved, through to signing a formal acceptance on Council’s behalf. This chart covers the procedures to be followed when a cheque, or EFT payment of a grant is received. This chart covers the period from when the funded project commences through to submission of the final (acquittal) report after the work is completed. The draft Flow Charts will be developed and appended to the existing guidelines, to ensure that the processes for all aspects of the grants process are readily available to all staff, thus ensuring Penrith City Council will achieve best practice in the administration of grants. In addition, pending the continuation of the role, the Grants Support Officer is planning for Penrith to host the inaugural meeting of a NSW Grants Officer Network in December. The GSO met with grants officers from Wagga Wagga and Wyong Councils recently, to develop a liaison with a view to establishing a state-wide Grants Officer Network. The past year has been a rewarding, interesting and challenging experience for the Grants Support Officer and it is anticipated that, with procedures in place this role can be even more proactive in researching and facilitating grants for Council and the community, with a focus on providing support, advice, research and skills enhancement programs for the community and the organisation. It is intended that over the next twelve months the Grants Support Officer would have a more proactive role in researching funding opportunities to resolve specific identified resource shortfalls in projects and programs. Funding for this position was included in the adopted 2006-07 Management Plan, pending endorsement of the continuation of the position for a further twelve months. 1. The information contained in the report on Position of Grants Support Officer following completion of a twelve-month trial be received. 2. Council extend the temporary position of Grants Support Officer for an additional 12 months to October 2007.